The Epiphone Les Paul Tribute Plus brings together the classic design of the Les Paul; with a pair of Gibson USA ’57 classic humbuckers and Epiphone build quality and value. The Epiphone Les Paul Tribute Plus is constructed with quality tonewoods. The back of the body is made of solid mahogany paired with a solid, carved hard maple top for the perfect combination of warmth and crisp snap. Continuing the theme is a hand-fitted, glued-in, solid mahogany neck with a 60's SlimTaper "D" shape profile for fast-playing comfort. The Epiphone Les Paul Tribute Plus is finished in a Midnight Sapphire Blue the beautiful grain of the maple top showing through. Of course where would all these amazing woods be with a decent set of pickups to successful interpret their nuances? Luckily you don’t need to worry about that; the Epiphone Les Paul Tribute Plus comes loaded with a pair of Gibson USA '57 Classic humbucker pickups. The '57 Classic sitting in the neck position gives you that humbucker crunch with even response and tone that is both warm and subtle. The '57 Classic Plus at the bridge gives you full-bodied vintage sound with a slightly higher output, reminiscent of the late ‘50s. Controlling the pickups is a Switchcraft three-way toggle switch and independent volume and tone knobs. What’s more the tones pots feature a push/pull design for series/parallel pickup switching. Vintage sound with a plethora of tonal-colouring options is yours with the Epiphone Les Paul Tribute Plus Electric Guitar. Posted on 19/10/2018 by xMclaren This guitar is outstanding. The look, the sound and the ease of play-ability. However, my guitar came with a faulty volume pot which kept slipping inside the body. I emailed Dawsons for a fix and they helped me a lot. I did end up returning the guitar as i had received a faulty product. Overall like i said, the guitar is outstanding and great for the price. Posted on 24/09/2018 by Andy Awesome guitar, it plays really well and is nice a heavy like the old Les Pauls. I did a lot of research to find a Les Paul with humbucker pickups, and it was worth the wait. The picture here does not do it justice, the colour is a deep glossy blue, watch the video to get a better idea. Posted on 12/04/2018 by Fr. Malc Bought this from MCr Dawsons. Really low action and easy to play. 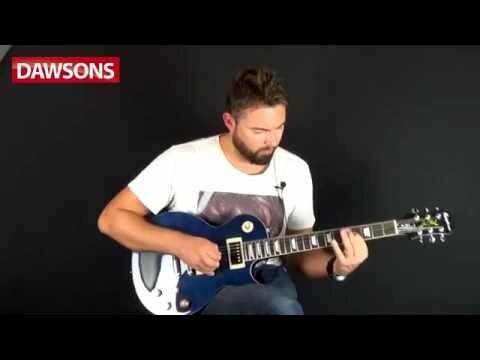 Tried a Gibson just under 4 times the price and the Epiphone felt better. OK, if I was Keith Richards I’d have bought the Gibson, but for Guitar per £1.00, this is just as good as it gets. Great instrument, I’m really pleased with it. Posted on 11/08/2015 by L.S Have done so much research on Les Paul guitars, came across this one and searched the internet for loads of reviews changed my mind from a standard to this one. It's beautiful to look at, sounds great and I can't wait to start messing around with it when my other kit arrives later this week! Super fast delivery too, thank you Dawsons & Epiphone! Posted on 03/06/2012 by Nikki Fox I've wanted a Les Paul for ages, either Gibson or Epiphone, after growing up with Slash et al - the Les Paul just IS rock. So after a small windfall, I found myself in Dawsons in Liverpool. I was instantly drawn to the Tribute Plus, on looks alone. I know it looks good on screen, but I've yet to see a picture that comes close to doing it justice in real life - all I can say is "stunning". Taking it down and handling & playing it was equally pleasing. Action is nice and low; the feel of the neck is great; and I love the weight of the LP. The hardware is great too - nice and solid, and fab pick-ups. It’s a bonus to be able to have them in series and parallel. All in all, I'm totally in love with this guitar!